Watching children develop and grow into their little personalities is an amazing thing. As Sully is changing out of the baby stage into the busy toddler stage, it seems every day he does something new (or gets into something he shouldn’t). Even though he is growing so rapidly, his language skills and gross motor skills are a few months behind. While he goes to physical and occupational therapy weekly, he doesn’t yet receive services for his language delay. At his last check up he wasn’t very far behind, but his doctor said that we needed to keep an eye on his vocabulary development. As I have blogged in the past, our family is working to build Sully’s vocabulary by doing a lot of talking to him throughout everyday activities. For example, I label items as we walk around the kitchen as well as tell him the steps I am taking when bathing him. I hope that by doing these things we can catch him up so that he can meet his age milestones one day. One afternoon, I was sharing with my husband about how Sully loves to listen to Goodnight Gorilla, a book with very few words, or a wordless picture book. My husband said, “Wait. Goodnight Gorilla does not have any words. You can’t read it.” I explained to him that even though there are very few words in the book, you could still describe what is happening on each page. For example, after the zookeeper says “Goodnight gorilla,” I always ask Sully if he thinks the gorilla will steal the zookeeper’s keys and escape his cage. For each page, I “fill in” the story that isn’t written down, by looking at the pictures. This helps him connect what he is seeing with the words I am speaking, therefore helping to strengthen his vocabulary. As I was browsing the IRRC Family Resources Collection, I came across the article “Sharing Wordless Picture Books.” I immediately thought about Goodnight Gorilla and how this resource would help my husband better understand how to interact with wordless picture books. “Wordless” describes how picture books with little to no words can often be great ways to strengthen children’s listening skills and vocabularies. It goes on to provide several great tips for how to use wordless picture books to create “literacy rich” experiences. “Wordless” reiterates to parents that there is no “right” or “wrong” way to read the story. Since there are no words, the story is up to interpretation of the “reader.” The article provides steps for how a parent should “read” a wordless book with their child. I searched online for a list of wordless picture books and was able to find four of the titles in our local library. I gave the books to the kids and had them browse through them and decide which one they wanted to read to the family. I even had my husband select one of the two books Griffin and Ryan hadn’t chosen to read to us (this way he can practice for the next time he reads a wordless book to Sully). I had everyone take a picture walk through the story. They had to look at all the pages and study the pictures to try to form a story in their minds. Next, I asked who wanted to go first. Naturally, Ryan said she wanted to read her book about a flamingo first. 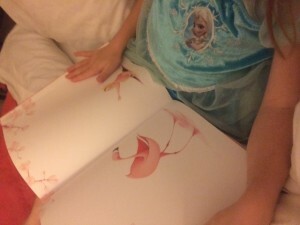 She went through every page, describing what was happening and how the flamingo and the girl were feeling. She loved having an audience and described how she had done some of the dance moves the girl character had done. Next, I picked up a book to “read” to the family. I started by looking at the cover and predicting what it could be about. I read each page by describing the changes made and what I thought the characters were thinking and feeling by looking at their faces. I have noticed that wordless picture books have to have a lot of detail in their pictures so that they provide a story. Once I had finished, Griffin said he didn’t feel like reading the book. I think he was feeling a little shy about making up the words. I encouraged him to just tell us what was happening on each page. The wordless picture book he chose was about children making chalk drawings that come to life. He described each page and even told us some of the character’s feelings. For example, when the dinosaur came to life, he described how the characters were feeling scared. Once he was done, we went around and told what we would like to come to life by drawing with chalk. I think Ryan had the best answer: a castle with a jet. This was such a great way to have a family conversation that makes connections with books. Finally, my husband had his turn “reading” a wordless book about a farmer and a clown. He described each page (with no words) and created a story that made sense. I was happy to see him participate in this activity with us and reminded him that he could do the same when he read to Sully, even if he is a baby. “Sharing Wordless Picture Books” is a great article to use to create literacy rich conversations as a family. It also is a great way for children to read, even if they cannot read words yet. I recommend you search “Wordless” in the IRRC Family Resources Collection to hear more about how you can share wordless books to build your child’s language skills.